A. Begley, K. Taylor, MA Catherwood, A Patterson, L Venkatraman, TF Lioe, I. Mainie, M Love, M Mitchell, RH Wilson, V.M. Coyle, P Kelly. Incidence of pancreatic cystic lesions (PCL) is increasing due to ageing populations and increasing cross-sectional imaging. PCL are often benign but have potential for malignant transformation, particularly mucinous cysts. Surveillance strategies and surgical intervention have implications for health economics and patient morbidity/mortality. Despite multimodality investigation, establishing that a PCL is mucinous and its potential for malignant transformation is frequently inaccurate. Molecular characterisation of these lesions may improve classification. This exploratory study aims to: determine the prevalence of BRAF, KRAS and NRAS mutations in a cohort of PCL and to correlate these mutations with standard clinicopathological features and patient outcomes. PCR and Sanger sequencing were used to determine KRAS, NRAS and BRAF mutational status of 20 patients with PCL. Patients were identified sequentially from MDM meetings as having PCL and undergoing diagnostic work-up including imaging, cytology and tumour marker measurement. The majority of PCL were incidental findings; 10% (n=2) underwent malignant transformation during the follow-up period. Mutations in BRAF and NRAS were not identified. KRAS mutations were found in 10%. No clear association could be found between mutational status, biochemical markers and clinicopathological characteristics or patient outcome at this stage. There is potential to use mutational status to determine if PCLs are mucinous and likelihood of malignant transformation, however further investigation in a larger sample set with mature outcome data is required. It is likely that mutational status will be helpful as part of a multimodality classification process that also incorporates radiological, cytological and biochemical assessments. 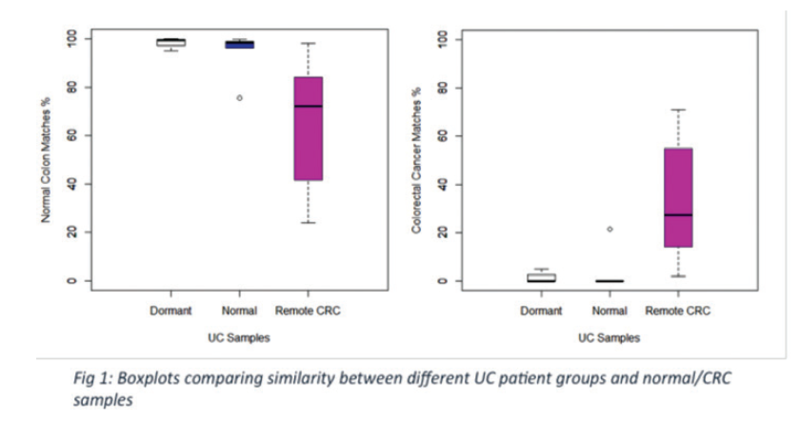 Mapping of Ulcerative Colitis Samples against Consensus Molecular Subgroups for Colorectal Cancer Demonstrates Potential to Identify At-Risk Ulcerative Colitis Patients.